In 1729 the building was much decayed and out of repair and it was ordered that the “Said Free School and Master’s House be repaired immediately according to the aforesaid estimate and that a gallery and convenient rooms be made therein for lodging boys, which are to be divided by a nine inch brick and lime wall to be sufficiently supported by pillars and otherwise from the ground cellars and foundations.” Shortly afterwards, a list shows 40 boys attending the school. 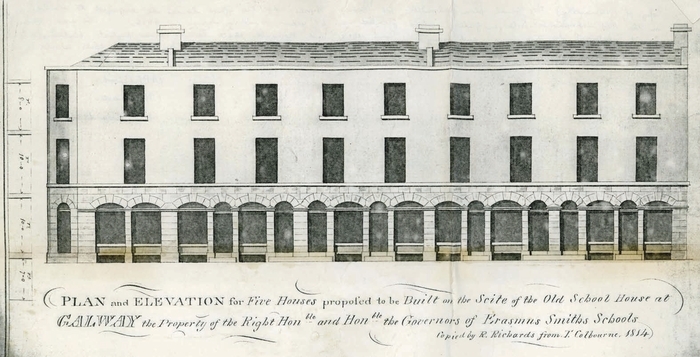 In January 1737, William Fraser of Tuam was paid £263-1s-5d for repairs, but more repairs were sanctioned in 1755. In May 1786, there was the first mention of finding a new site for the school. The governors decided to build a new school with accommodation for 50 boarders at Fort Eyre at a meeting on February 24, 1797. This is where the Grammar School was until recently, when it became Yeats College. At one time, the corner shop (seen on the left of our image and now known as The Bistro Wine Bar ) was Darcy’s Pub and later Langley’s Pub, and for a number of years Kennys had an antiquarian map shop there. The next two buildings were Campbell’s General Store. About 1920, they sold one part to Curran’s Pub, which later became Egan’s Pub and today is The Bunch of Grapes. Next door was Naughton’s famous drapery shop which is now known as Sonny Molloy’s. The section on the right was leased to Monica McDonogh in 1908. She had a general store there with living quarters upstairs and servants’ quarters downstairs. She died in 1933 and left the building to her son Dr Thomas McDonogh, who in turn left the building to his sister and nephew. In 1960 it was bought by John and Kathleen Raftery who used it as a warehouse. In the early 1980s it was purchased by the accountancy firm Fitzgerald and Grogan which did a major renovation and in the process, uncovered the original stonework on the ground floor. Finally, if you are still stuck for a Christmas gift for an old Galwegian, we can recommend some local books including new title by Pearl O’Kennedy entitled I Remember, I Remember, a charming collection of stories of her growing up in Shantalla and it is beautifully illustrated by the author. By Corrib, Clare and Cregg is the title of Seán Ó Murchadha’s bilingual book about his life and times and bygone days in the Cregduff/Corundulla area. Galway Spirits is a collection of Galway ghost stories by Peadar O’Dowd which will probably send a chill up your spine. Galway Through Time and Tide is a collection of William Henry’s weekly articles published in the Galway Independent. Kiloughter of my Youth is a collection of stories of that area by John Connell. For a young Galwegian , there is the beautifully illustrated Oisín the Brave by Derek Mulveen and Michele Melville. All of these are recommended and available in good bookshops.